Russell Tyler, 4TRS, 2013, oil on canvas, 36 x 36". This show contributes to the heated debate over the relationship between contemporary art and digital technology by cleverly focusing on the idea of “windows.” In this context, windows is a double entendre, referring both to the long-standing metaphor for the picture plane in Western art and to the more recent use of overlapping frames to organize information on computer screens, challenging the window’s association with a single-point perspective. The artists in this show are fluent in both senses of the term as they were all born more or less around 1983, when Microsoft introduced its revolutionary operating system. Notably, however, these “digital natives” choose to express themselves not primarily through the language of new media, but through paintings that, taken as a whole, prove anew that the visual logic of the computer desktop is reformatting the production of pictorial space. The exhibition’s theme is announced most obviously by the paintings of Russell Tyler, who juxtaposes geometrical shapes redolent of computer graphics with sensuously textured paint, as if to resist the virtualization of the visual by producing resolutely material surfaces. 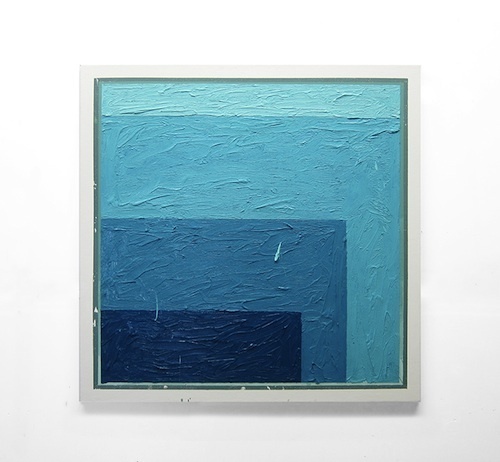 In 4TRS, 2013, three overlapping, tonally varied planes of blue make obvious reference to Josef Albers’s “Homage to the Square” series, but Tyler morphs his cascading squares into staggered windows on a computer screen simply by shifting them from the center to the periphery of the canvas. Trudy Benson’s work is similarly bilingual, speaking to both the art of the past and the digital forms of the present, while asking us to consider the relation between the two. At first glance, her Selection, Delete, 2013, has the colorful exuberance of early-twentieth-century abstraction, but anyone who used a PC in the 1990s will identify the work’s heterogeneous materials (including spray paint and acrylic paint) as a catalogue of the range of effects one could layer within a single frame in MS Paint. That the aesthetic choices encoded in decades-old software programs determine the appearance of actual painting is the crux of the show.